One of the things I love most about being a member of Boston Handmade is how genuinely interested the members are in supporting one another. It is a dynamic group of people who really want to see everyone succeed, and when we come together great things happen. At our February meet-up we each went around and gave an update on our businesses and used this as an opportunity to ask each other questions and provide feedback. When it came to my turn, Lucie Wicker, who is an amazing fitness photographer, asked if I was making any more fitness jewelry after seeing pictures I had posted on my Instagram account of a custom order I was working on. Up until that point, it really had not even occurred to me to continue making fitness jewelry, though I really enjoyed making this new piece. At everyone's urging, an idea started to form. Members started throwing out ideas, and my excitement over the idea began to form. I knew I had to act fast. With that, I am so excited to announce the debut of a new line of fitness jewelry Linkouture will be offering. In honor of the Boston Marathon happening next month, I will be kicking off the line with a limited-edition runner charm bracelet available for order between now and Monday, April 21 (the date of this year's marathon). 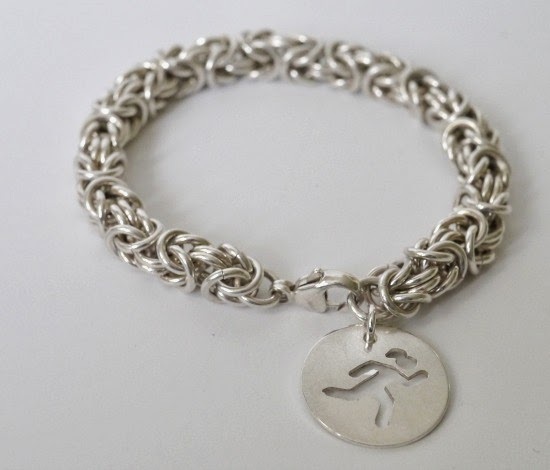 Made from recycled sterling silver, this chainmaille bracelet features a hand-sawed runner charm, and proceeds from each bracelet will be donated to the One Fund Boston. You can read the full story behind the bracelet here, and pre-order them on my Etsy shop.